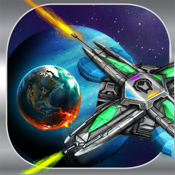 Escape to Arae: A Fun Addictive Space Shooter Intergalactic Clash! Escape to Arae - a one of a kind Space Shooter! An incredible new approach to crushing Kamikaze style Alien onslaught! Lots of power-ups and a variety of enemies with interesting behaviors! *** An Alien race called Fremdon is turning our cities and towns upside down! Looking for an ancient Codex, which has given us the ability to explore new Worlds and Galaxies. Because of their onslaught we have suffered colossal damages.The League of Nations has decided to evacuate planet Earth and set up a new home on Mu Arae C – a Super Earth. This Intergalactic Clash of Civilizations is happening at your doorstep! You must join other Heroes and Crush this Alien onslaught! Will you be the Hero today? How long can you survive and hold the enemy back to help other fellow Humans Escape? Fight space battles and defend the human race.